At Villa Vici, we value our outside designer partners and the business that they bring to our store. We are a one-stop-shop and design resource offering the best selection in upholstery, case goods, lighting, floor coverings, window treatments, bedding and accessories. In addition to our discount/commission program*, you will receive exclusive invitations to design events and product previews. Fill out the Trade Application Form and please stop in at your earliest convenience to introduce yourself. *Trade discount is not valid with any other discounts or offers, purchase of gift cards, promotional items, shipping and delivery fees, taxes or any products or services excluded by Villa Vici. 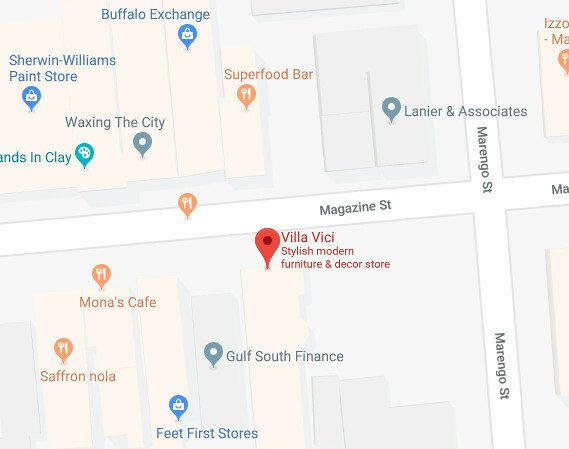 All Villa Vici store policies apply including but not limited to no returns on custom and/or special orders. How did you hear about Villa Vici? I would like to receive updates from Villa Vici. If available, please upload a copy of your business or resale license along with this application. Please create a password below. If your Trade Application is approved, it will become your future Villa Vici login credentials. Villa Vici’s designer discount program expires 1 year from your registration date. Designer must update registration each year to be qualified for discount. Designer will receive commission upon delivery and payment in full by the customer and/or designer on the 15th of the month after delivery was made. Please accompany your client to the store to ensure proper credit of any commission due. If you are unable to accompany your client, commissions will not be paid unless prior approval has been made. All Villa Vici store policies apply. The above information is subject to approval. Discount is non-transferable and cannot be combined with any other offers or promotions. We reserve the right to deny anyone the trade discount. All orders must be paid in full before delivery. Customer is responsible for all delivery cost and/or drop shipment expenses. I agree to the terms and conditions of the Villa Vici designer program.